Sipsey Street Irregulars: "A totally unrealistic rendition of government." -- A Tongue-in-Cheek Review of Defiance. "A totally unrealistic rendition of government." -- A Tongue-in-Cheek Review of Defiance. From Lawyer Daggett at Like A Gun blog we have this tongue-in-cheek movie review of Defiance. Very funny. Well, maybe not so funny. A H/T to the Dweeze for drawing my attention to it. I see an average of 1 movie a year thus I am a guru of movies, acting and all things Hollywood. 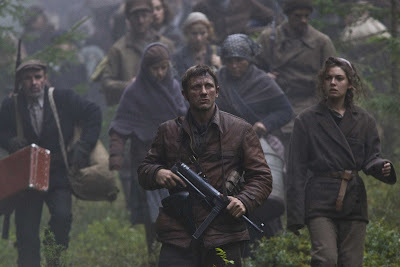 With that in mind I highly recommend you all go see a fantasy thriller that I think is out nationwide called Defiance. It stars Daniel Craig who I think I should have heard of, he looks vaguely familiar but I can’t place him. The basic plot (I won’t ruin it for you) is a gang of paranoid gun crazies who band together and terrorize a benevolent government that the crazies feel like are threatening them. The crazies run off in the woods like crazies are prone to do, they don’t pay their taxes and are generally hostile to the various government folks trying to help them and solve their problems. It is set in the ancient past that no one cares about anymore. The crazies generally all have relatives that were justifiably killed by the benevolent government who was trying to help them, which makes them mad and what is a crazy if not mad about something. It seems the crazies were also religious people…very consistent with crazies as I know them. They also live in a camp, which probably should have been called a compound. In the end the government people attempt to drive their armored vehicles into the compound and light it on fire for the good of the crazies themselves. The crazies continue on the run for a long time hiding in the wilderness…probably using survivalist militia tactics. Anyhoo…good flick, it would be disturbing if it weren’t so totally fanciful and set approximately 700 years ago along with being a totally unrealistic rendition of government. While I've yet to see the movie, that review was a hoot! Thanks for the tongue in cheek chuckle, Mike.